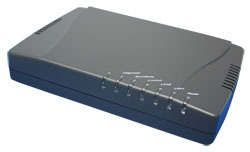 The strong point of PhoneLine (or HomePNA) networks is that you can use the existing telephone or coax wires to network your home PCs or other equipment. 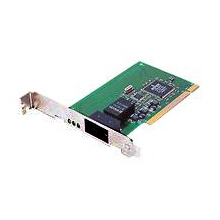 As with other home network technologies (Ethernet, PoweLine, WiFi etc), you still need a compatible Network Adapter for each device to be installed. Then, all you need to do is connect a normal telephone wire (or coax cable) from each networked device to a wall telephone jack (or coax plug). The current version of Home PNA is 3.1. This supports data speeds up to 320 Mbps, which is a considerable boost from the older version 3.0 (128 Mbps) and from version 2.0 (10 Mbps). The diagram below shows a simple PhoneLine home network. As shown on the diagram above, you need a HomePNA adapter (either internal or external) for each PC/Laptop to be connected on the Phone Line infrastructure of your home. 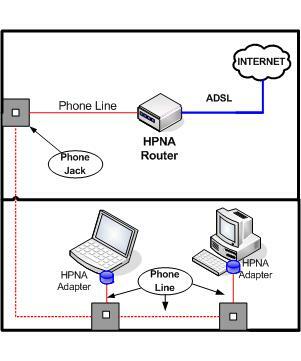 HPNA adapter: You can use either PCI or USB HomePNA adapters for connecting your computer to the PhoneLine network. HPNA Router: Here we have many choices. In our example network shown on the diagram above, the HPNA Router incorporates both PhoneLine and ADSL connectivity to bring internet access to the home network. There are products also that incorporate a mixture of access technologies on the same unit, such as WiFi, HPNA, and Ethernet. 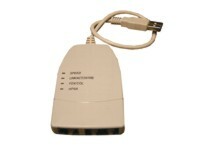 With such a product you can create a hybrid home network with various connectivity methods.